coherency in the lattice structure [20-22]. to allow the gases to escape. at 600°C for 2 hr. The melt is poured into the preheated permanent mold and allowed to solidify. Table 1 depicts the nominal composition weight percentage of Al-Mg-Si matrix material. hardness test to get peak hardness. Figure 3 shows the heat treatment cycle for Al 6061alloy. the average tensile strength values are depicted in Table 3.
experiment and the predicted values from regression equation are given in Table 4.
determination and denoted by R2. In the model, R2 is obtained equal to 95.40% for UTS values. to have statistically significant effect on the response. Figure 6: Normal probability plot for UTS measurement. Table 4 Regression data showing measured, predicted and residual values for the UTS. on the UTS followed by the aging time. aging time of 10 hr and solutionizing time of 2 hr. time has very less influence on the UTS. and the predicted values of the UTS. Alloy 6061-T6. Chi. Matls. J. Sci., 2009, 36(3), 276-286.
tribological properties of Ti-6Al-4 alloy. Ir. J. Mat. Sci. Engg., 2017, 14(3), 21-33.
microstructure and hardness of In-Situ Aluminium matrix composite containing Al4SR phase. Ir. J. Mat. Sci. 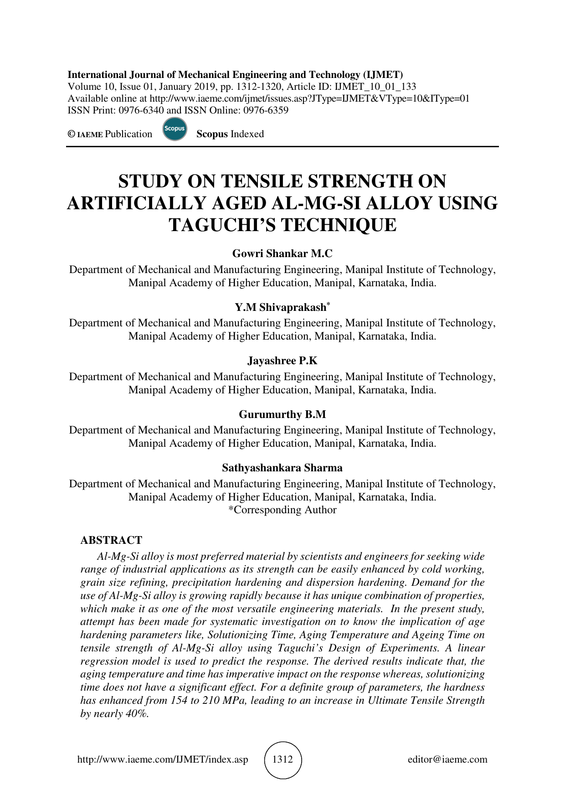 Engg., 2014, 11(4), 48-54.
behaviour of 6022 aluminium alloy, I. J. Plas., 2004,20(1),427–445. method. J. Mat. Proc. Tech. 1999, 92(1), 1-7.
aluminium matrix composites. J. Mat. Proc. Tech., 2001, 119(1), 329–335. alloy. J. Mat. Proc. Tech., Vol-119:324–8. University of Warwick, 1969, 58-90. John E., Gruzleski., The treatment of liquid Aluminium and Silicon Alloys. 1990,2,172-175.
phenomena in Al–Mg–Si Alloys, Mat. Des. 2004, 36, 736-740. Miao W.F., D.E. Laughlin., Precipitation hardening in aluminum alloy 6022. Scri. Mate. mechanical properties of 6061 aluminum alloy, Mat.Des. 2010, 31(1), 972–975. Rajasekaran S., N. K. Udayashankarand Jagannath Nayak., T4 and T6 Treatment of 6061 Al15vol. % SiCp Composite, I.Schol. Res. Net., 2012, 1-5. Rajan T. V., C.P. Sharma., Ashok Sharma., Heat Treatment- Principles and Techniques, East. Econ. Second Edition, 2012, 40-78. Sidney H Anner., Introduction to Physical metallurgy-Second edition, 1976, 2,190-194. Casting and Diffuses Annealing Process, Ph. Proc. 2013, 521-535, 68 – 75. Cast Al-Mg-Si-X Alloys, Mat. Tran, 2003, 44(12), 2617-2624.
compressive properties of metal matrix composites, Mat. Char. 2012, 47, 129– 138. Taguchi. Introduction to quality engineering, Asian productivity orgnization, 1990, 2, 45-70.
and surface micro hardness”, I. J. Ad. Man. Tech. 2006, 28,707-713.
influence of heat-treatment parameters on the hardness of AA6061-SiCp composite, J. Mat.